We’ve always loved bees, and lots of our projects help bees as well as other wildlife. However, our bee story really started when the Isle of Wight Festival invited Gift to Nature to help green-up their event. 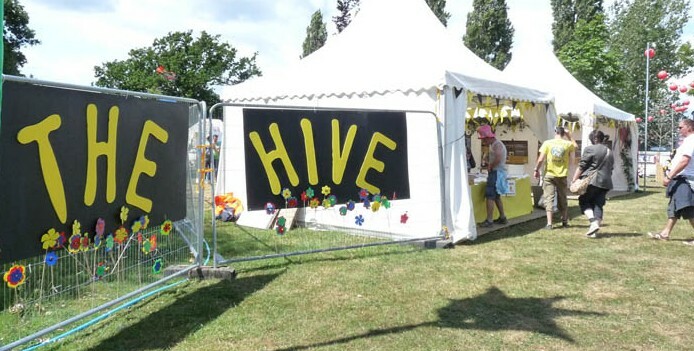 We developed the Hive which grew over several years into a fantastic nature-focused zone at the heart of the festival site. It was enjoyed by thousands of revellers many of whom left the festival intent on helping bees where they live. We have dressed up as bees, painted big Biffa bins with bees and done (almost) anything to spread the word that our bees need help. How has Gift to Nature helped bees so far? We have funded a major piece of research into habitat improvements and their impact on Solitary Bees and other key species on the south coast of the Isle of Wight. We funded a study of a little field in newchurch where we spotted some unusual bees. On finding that this little field supported species never before seen on the Island and some very rare ones. We worked with the landowner to stop the precious habitat being lost to rapidly growing tress (bees like it hot and sunny) and we are creating extra habitat to promote these rare species. We have contributed to national bee research. We support the annual Isle of Wight Hedgelaying competition which increases the length and quality of hedgerows around the Island and promotes the craft of hedgelaying. We promote planting of fruit trees and other nectar bearing plants such as red clover and birdsfoot trefoil. We manage several sites to encourage wildflowers and trees which provide a vital food source for wild bees. In 2009 we planted a new meadow at Chilton. Click here for details of Chilton Chine. We have contributed to VERA’s allotment hives to ensure their hives are healthy and continue to pollinate the surrounding wildflowers and fruit crops. We have researched into UK crop pollination by bees. We looked at which crops need bees, when and the habitat requirements of individual pollinators. While we were working on our bee project we discovered something amazing happening in a field in Newchurch. We found huge numbers of bee species in this group of fields. From the earliest to emerge in March to the latest in November the Bee Fields are alive and buzzing, but there’s nothing to fear, these are in the main tiny mining bees that burrow into the sandy soil, far too small and preoccupied with their mining to be a threat to anyone. 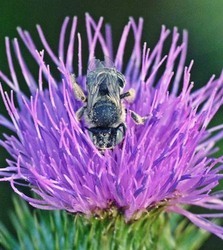 In fact it is a place to visit precisely because it is so wonderful for bees. We’ve all heard the global concerns over collapsing bee numbers, the loss of hives and the increasing threat to crops which we rely on these insects to pollinate for us. To see a site so alive with these same species is a welcome dose of optimism. The site ranks amongst the most important bee conservation sites on the Island, alongside heavily protected nature reserves that have a national significance. The Isle of Wight is one of the most important places in the UK for its bees and wasps and so the Bee Fields are now of national interest. The Bee Fields were an old sweetcorn field which has been set aside for wildlife. 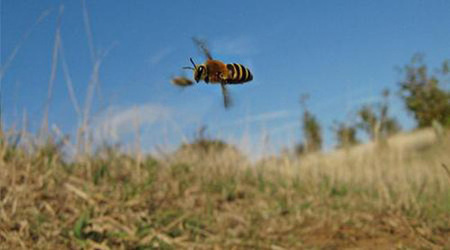 While passing in 2009 we noticed a small colony of a rare bee species Dasypoda hirtipes in one of the fields. This prompted us to raise funds for a more in-depth survey of the site’s hymenoptera (bees and wasps). The results were staggering: 96 species of bee and wasp of which 23 are nationally rare and 3 completely new to the Island! Thanks to funding from our supporters, raised in partnership with the Isle of Wight Festival (through the ‘Let it Bee’ campaign) and a grant from the AONB’s Sustainable Development Fund, we cleared more glades for the bees, building special nestbanks and planting new flower species. We are really pleased that since December 2014 the site has been taken over by Hampshire and Isle of Wight Wildlife Trust and will be managed by them in the future. This means the site is safe and secure for future generations.